Quickly and easily pop a single batch of kettle corn popcorn with this hassle-free Carnival King all-in-one kettle corn kit! Kettle corn has a light color and boasts a lightly-toasted flavor which makes it a crowd pleaser that's sure to boost impulse sales at your venue. 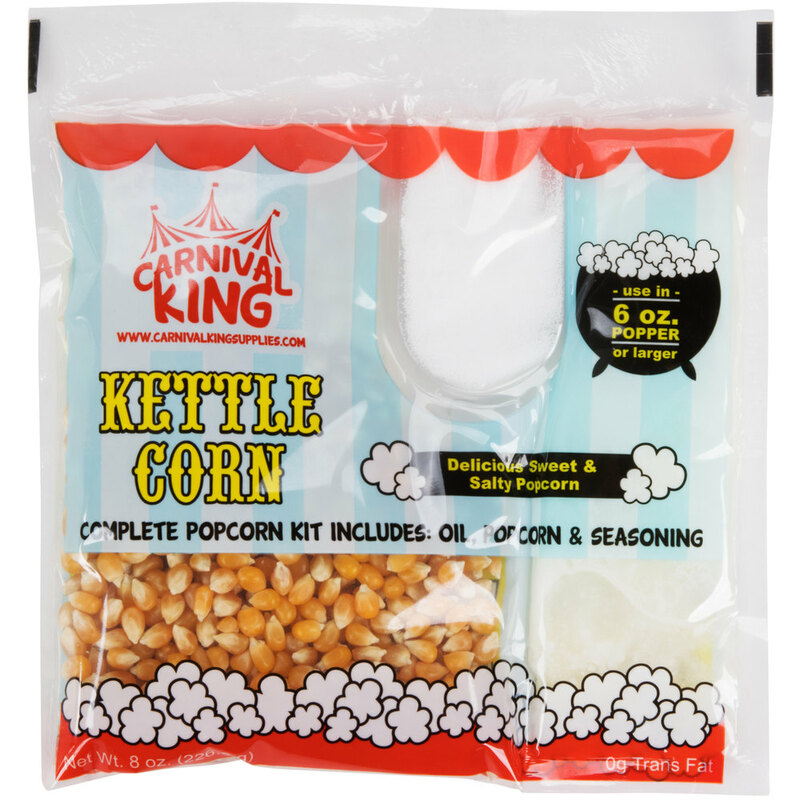 Carnival King is the brand to trust for your concession supplies, and this complete kettle corn kit includes everything you need to pop the perfect combination of slightly sweet and salty popcorn. The separate, pre-portioned quantities of kernels, seasoning, and white coconut oil significantly cut down on waste from bulk ingredients and provide excellent inventory control. You'll be able to make the right amount of kettle corn when you need it, and there's no mixing or measuring required! To use, simply let your 6 oz. or larger popcorn kettle heat up, pour the kit's contents into the kettle and within minutes your kettle will be filled with tasty, fresh kettle corn! Single use popcorn kits work well for small to medium volume applications like department store concession stands, school fundraising events, office break rooms, convenience stores, small carnivals, church events, and single-house theaters. This quality kettle corn kit includes non-GMO kernels and flavoring that gives your popcorn a classic, state fair-quality taste. The white coconut popping oil offers a clean and light taste and won't leave as much oil residue in your popcorn kettle. Containing 0g trans fat per serving, this all-in-one kettle corn kit makes it easy to produce consistent batches of fresh popcorn!